The number of Americans enrolled in the food stamp program has dropped nationwide as a result of an increase in states requiring food stamp recipients to work to receive benefits. The U.S. Department of Agriculture (USDA) statistics for fiscal year (FY) 2017 show that food stamp enrollment decreased nationwide by 2.9 percent over the past year, in part because of states that are implementing work requirements to participate in the food stamp program. Georgia and Alabama are seeing the results after they rolled out work requirements for their respective food stamp programs in 2016 and 2017. Georgia saw a 62 percent drop in food stamp enrollment since January 2016, when Georgia first implemented its work requirements for the state’s food stamp program. Thirteen counties in Alabama saw an 85 percent decrease in food stamp enrollment once the state re-instituted work requirements in January 2017 throughout the state. The number of able-bodied adults receiving food stamps statewide dropped by 35,000 since January 1, 2016, when Alabama implemented work requirements for the other 54 counties. Work requirements had been underway at the state level for years, but efforts had stalled because of the 2009 economic stimulus put in place by the Obama administration to respond to the 2008 recession. At the federal level, the USDA website has a section that says able-bodied adults without food stamps can only receive food stamps for three months over three years without working or participating in state-approved job training, but many states chose to waive the time limit as a result of the economic downturn. As the economy slowly recovered from the recession, food stamp enrollment soared to an all-time high. In 2013, food stamp enrollment across the country peaked to nearly 48 million. “Work requirements have been enormously successful at reducing the number of people on food stamps. And while they made sense in the early part of the recession when unemployment was higher, that is no longer the case,” Robert Doar, a fellow in poverty studies at the American Enterprise Institute, told Fox News. Maine spearheaded the way in food stamp reform in 2014, when Gov. Paul LePage announced that all able-bodied adults who wished to receive food stamps would have to work, be it in a job training program for at least 20 hours a week, or complete at least six hours of community service per week. As a result of the state’s work requirements, participation in the food stamp program dropped 14.5 percent from January 2014 to January 2015, according to state data on food stamp enrollment. A study of 7,000 Maine residents who left the Supplemental Nutrition Assistance Program found their collective earnings as a whole increased from $3.85 million in 2014 to $8.24 million at the end of 2015. A report from the Foundation for Government Accountability showed that food stamp enrollment in Kansas plunged by 75 percent after the state implemented work requirements. Sixty percent of people who stopped receiving food stamps found a job within 12 months and reported an average 127 percent per year increase in income. 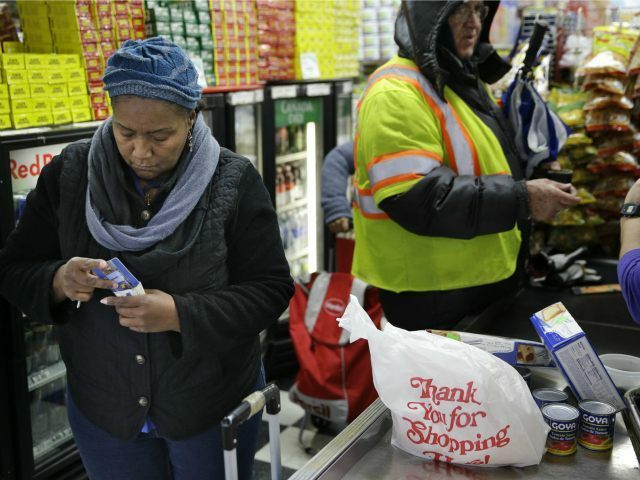 The work requirement trend to receive food stamps might even be implemented nationwide. Fox News reports that Rep. Jim Jordan (R-OH) and Sen. Mike Lee (R-UT) are working on legislation that would implement food stamp work requirements at the federal level and reinstate time limits on how long people can participate in the program.